My uncle David who lives on Vancouver Island, told me a secret: he said don't tell Aunt Lucy, but when him and his twin brother Dan turned forty they were both going to purchase a brand new Harley-Davidson and head down the highway of life. Well forty has come and gone, and they still haven't got their Harleys, but when uncle David's in town he likes to visit the Trev Deeley Motorcycle museum, ...and fantasize about motoring down an open road, the wind flowing through his thinning hair. 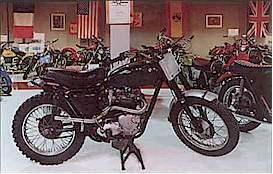 The museum has over 270 units - 50 different makes and models on 2 levels of display, many pictures and memorabilia to get sentimental about. Open seven days a week, check website for hours and admission cost. Located at 1875 Boundary Road, Vancouver. For more information call 604.293.2221. Website: www.deeleymotorcycleexhibition.ca.